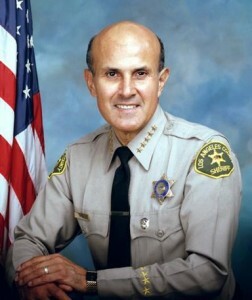 LOS ANGELES – Former Los Angeles County Sheriff Lee Baca “monitored” and “condoned” an internal conspiracy to thwart a federal probe into abuses in the jail system and then lied to hide his actions, a prosecutor told jurors Friday, but a defense attorney threw blame squarely on the ex- lawman’s former second-in-command. In a roughly 90-minute opening statement in Baca’s retrial on corruption charges, Assistant U.S. Attorney Brandon Fox said Baca was entrusted to bring criminal conduct to light. Instead, the then-sheriff “tried to conceal it” by tampering with witnesses and retaliating against those who were investigating his department, he said. The prosecutor told the 11-man, five-woman jury that evidence would show Baca “authorized the actions of co-conspirators” in a complex plot to derail federal officials and then gave false statements when confronted about it. Baca is accused of conspiring to commit and committing obstruction of justice from August to September 2011 and lying to the federal government in April 2013. Prosecutors contend Baca lied to the FBI about his knowledge of department efforts to subvert the probe into corruption and inmate abuse in the jail system. “Keeping the FBI away” from the sheriff’s department “was not on Sheriff Baca’s agenda,” the defense attorney said in his opening statement. Baca, 74, was tried in December on obstruction of justice and conspiracy to obstruct justice counts, but jurors deadlocked 11-1 in favor of acquitting the former sheriff. U.S. District Judge Percy Anderson then declared a mistrial. At his retrial — expected to take about two weeks — the former sheriff is also facing a third felony count of lying to federal officials. Prosecutors plan to play audiotape of the interview in which Baca makes the alleged false statements. The charges partly stem from a 2011 incident in which two sheriff’s investigators confronted an FBI agent involved in the jail probe in the driveway leading into her apartment and falsely told her they were in the process of obtaining a warrant for her arrest. The case against Baca focuses on a period of time when sheriff’s deputies based at the Men’s Central Jail stumbled on a secret FBI probe of alleged civil rights abuses and unjustified beatings of inmates within jail walls. Prosecutors contend Baca so resented the federal government’s jails probe that he attempted to force the FBI to back down by illegally having deputies confront the agent at her apartment. The prosecution also alleges that Baca ignored years of complaints about excessive force used illegally against jail inmates in county facilities managed by the Sheriff’s Department. The third count — making false statements — alleges that Baca lied to the FBI in April 2013 about his knowledge of department efforts to subvert a federal probe into corruption and inmate abuse in the jail system. Baca maintains he had no knowledge of what was being done in his name by Tanaka and other subordinates. The former undersheriff is serving a five-year prison term for his conviction on obstruction of justice charges similar to those Baca faces. Eight other former deputies were convicted and are serving time in the case. Anderson made several significant rulings that will impact the way jurors hear the case. In the first trial, Hochman spent a large portion of his opening statement recapping Baca’s nearly half-century career with the sheriff’s department, and focused on his client’s “prior good works” during more than 15 years as leader of the agency. He also called a string of retired local and federal officials to give evidence of Baca’s character. But the judge granted a prosecution motion to prevent the defense from introducing such testimony, finding that such evidence does not directly pertain to the charges for which Baca is being tried. And he barred Baca from wearing his mini-sheriff’s star lapel pin, as the former lawman had been doing for court appearances since he was first charged in February 2016. During Hochman’s opening, he discussed Baca’s work with the Office of Independent Review — something the judge had frowned upon in the ruling. After the jury left for the day, a plainly angry Anderson berated the defense attorney, warning him that if he does such a thing again, the lawyer would not appreciate the result. The jury’s composition varies dramatically from the previous panel. The current group is noticeably younger and far more ethnically diverse. Anderson said the panelists would remain anonymous due to the media attention the retrial is expected to draw and to lessen the chance that they are contacted during the proceedings. Baca’s lawyer had asked the judge to allow UCLA psychiatrist and Alzheimer’s expert James Spar to link Baca’s alleged criminal actions to a years-later diagnosis of mild cognitive impairment. The first prosecution witness — Baca’s former driver Kevin Brown — is expected to be called Monday morning. 9 comments for "Prosecutor blasts Baca for “abuse of Power”; defense lays blame on undersheriff"
This is Rex’s pal. They were hugging all over each other not long ago in front of the courthouse in Lancaster. Birds of a feather flock together. They already jailed a number of deputies. Nowhere near enough of them, but you can’t remove the entire department all at once. Reforms will get a bunch more over the next few years. I think there is value in sending the message that the guy at the top will be held accountable. It gives the ongoing reforms more likelihood of getting done. Hey buddy. You won’t see me on the news anytime soon. I have an unlikely ally from the opposite side (wink, wink) who gives me insight and forthought to keep me balanced. Sounds like a good guy. You are wise to have found him. Baca was buddies with Rex. The FBI should look into the shenanigans going on in Lancaster. They’d have a field day.